The sheets provide national and individual markings for every scheme, with no shared items, so you can build all 6 options. 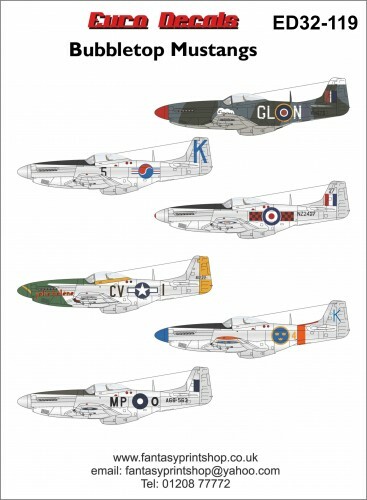 The decals are beautifully produced, with faultless registration on the sample sheets. The glossy items have minimal excess carrier film around national markings and larger code letters – and where there is fill-in to support smaller characters or groups of items it is crystal clear. The colours and the density of the inks look excellent. The instructions are supplied as a 4-page A5 colour booklet, with each scheme illustrated as a clear 4-view diagram. The colours for each option are given with FS, Humbrol, Xtracolour, Xtracrylic and Lifecolor matches. North American Aviation proposed the design and production of a more modern fighter.